FIFA Soccer 06 review Game Over Online - http://www.game-over.com Throw your football helmets in the trashcan. Burn your basketball sneakers and jersey. Take your baseball uniform and use it as a dust rag. If you’re really looking for the most popular sport in the world, you’re not going to find amongst these three. You’ll get it on the pitch of football (or soccer for Americans) stadiums around the world. 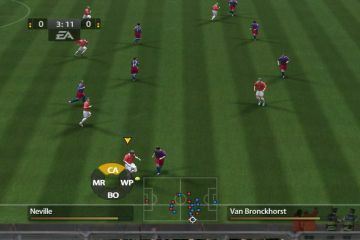 The FIFA franchise has often received the standard sports game update from year to year, expanding the scope of the sport on consoles incrementally with team and roster updates. However, this year’s update seems to be the most complete package EA has ever presented. Get ready, because we’re stepping on the pitch of FIFA Soccer 06. 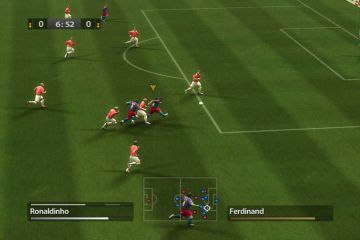 Like some of EA’s other sports titles, FIFA 06 takes the “sink or swim” approach of acclimating to the new year’s gameplay by literally throwing you into a match almost as soon as the game starts up. After choosing a favorite club and a control scheme that will determine how you’ll play, you’re immediately challenged to a match by a “classic” team made up of soccer vets like Zico, Rudi Voller and Eric Cantona. Sure, you have the option to turn the match down, but you’ll be losing the opportunity to acquire a number of points that you can use to open a large number of unlockables in the FIFA Fan shop. Some of these include additional stadiums, teams, player celebrations, seasonal highlights for four different leagues and other items. But don’t think that you’re going to blow past this team either; the classic team will give even the hardest FIFA vet a run for their money. Fortunately, there are a number of new additions to this year’s title that will make your climb to the top of the football league standings. First of all, you can literally adjust your team’s offensive and defensive tactics on the fly. This means that you can respond and react to a situation, making your team a more dynamic unit as the game progresses. You’re also able to combine more than one tactic to keep the opposing squad on its toes as well, so you can press the advantage with wing plays and overloading the box to force your team to swarm towards the goal. You’ll slowly pick up on these as you go along, since the instructions of how to execute these plays to their best effect are held in the tutorial section of the game, but once you understand how to use them, you’ll constantly adjust your tactics to best help your team. Making strong plays and denying the opponent the ball in key situation is extremely important because of the redesigned focus on Team Chemistry and Morale. Your players now actively weigh how good a game is going based on how recent plays near them have gone. Wind up losing a ball to an opponent and your strikers might wind up slumping or making errant passes whenever they have an opening. On the other hand, if you wind up stealing the ball and taking a number of great shots that almost go in, your team’s morale shoots up and your players play harder and run faster. You’ll need to keep an active eye on how tired your squad gets also, and actively substitute your players with those on the bench. You’ll want to get your bench riders in frequently to keep their team morale up as well because any griping they make on the bench can depress the morale of your entire team. This takes on a new meaning when you’re playing the manager mode, where you’ll take a club and manage every single aspect of it for fifteen years. You won’t be able to take on the job at the premiere clubs at first as an unknown, but you’ll be able to build up both your team and your resume enough to become a force in the football world. This includes your staff, scouts and other team management decisions. Each one of these managers, scouts, coaches and other positions have their own ranking that can be used to rate their effectiveness in the front office and in their field positions. It can be tempting to sink all of your money into boosting your stats, but then you won’t have any additional dough to leverage trades, expand your stadium or perform any of the other maintenance items that you may need to do. However, you can bolster your coffers by signing a sponsorship with any one of a number of companies that will ask for a certain level of progress to remain on the payroll. It might seem like a good idea to go for the larger contract, but quite often these sponsors have stricter requirements to remain in good standing. You’ll also notice a number of problems that can arise that you’ll need to handle as the club manager, including fights that will break out between yourself and other managers, fan dissatisfaction or answering questions for interviews. Properly handling these situations can give your squad a boost, but it might also negatively affect another party, so you’ll need to actively weigh the pros and cons of every decision you make. Were there a more in-depth handling of some of these situations so you could fully understand what was at stake with these situations, the Managerial mode might be perfect. But the game does handle trades and releasing players within budgetary means better than just about any sports title out there. 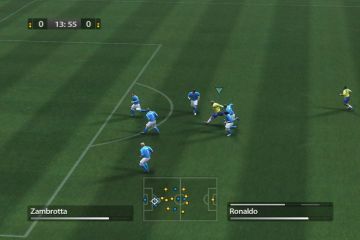 Apart from this, there’s a new mode known as the FIFA 06 Lounge that allows two or more players a chance to play a number of matches based on different criteria. Some of these, like Winner Stays On allows the victor to continually challenge all comers while other ones, like Best vs. Worst lets you pit skilled players against less skilled ones while balancing out any handicaps that might occur with a number of “cheats” such as an abundance of yellow cards or immediately fatiguing an opposing player. Weaker players can actually trigger some of these effects whenever they want to try to balance out the game, which provides a fun, arcade like flair to multiplayer games. 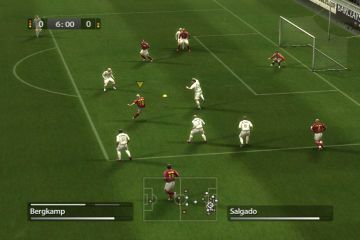 Easily the best looking title in the series to date, FIFA 06 does have a tendency to slow down every now and them, particularly when a lot of the players charge one side of the field or another. It’s not a major problem, but it does become rather noticeable when you’re volleying the ball back and forth and you notice that the game action has dipped for a bit before it picks back up. For the most part though, the camera angles that are pulled out wide to show a larger slice of the pitch gives you a great sense of the game action. 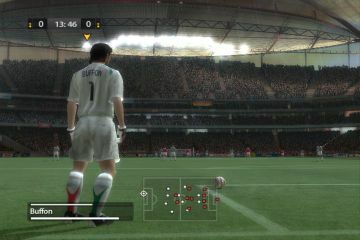 When the game zooms in for cutscenes, such as celebrations after scores or penalties, you really get a sense of how detailed the player models are. A lot of the athletes look like their real-life counterparts, which is a great touch to the realism of the game. The stadiums look great as well, and you can tell the difference between each arena. 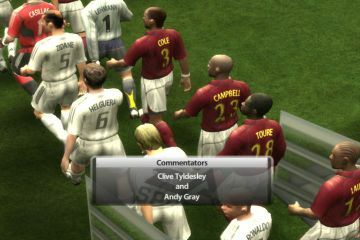 The game is bolstered by the addition of color commentary by Clive Tydsley and Andy Gray, who are pretty good in keeping the dialogue interesting without continually repeating themselves. The true standouts are the crowds that perform club chants during matches and give you a real sense of being in the stadium. Similarly, EA has included a large number of songs from groups around the world that provide an international flair to the game. It’s much better than some of the other sports soundtracks that seem produced in a blatant musical genre. Throw your football helmets in the trashcan. Burn your basketball sneakers and jersey. Take your baseball uniform and use it as a dust rag. If you’re really looking for the most popular sport in the world, you’re not going to find amongst these three. You’ll get it on the pitch of football (or soccer for Americans) stadiums around the world. 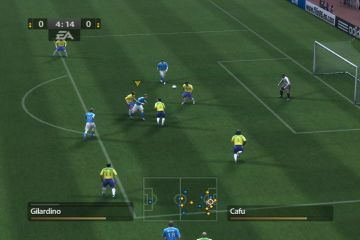 The FIFA franchise has often received the standard sports game update from year to year, expanding the scope of the sport on consoles incrementally with team and roster updates. However, this year’s update seems to be the most complete package EA has ever presented. 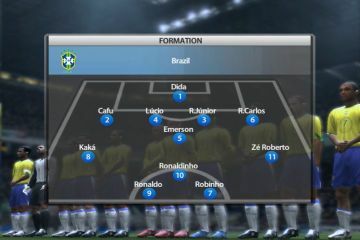 Get ready, because we’re stepping on the pitch of FIFA Soccer 06. Simply put, if you’re a fan of football (or soccer), you really can’t miss with this title. 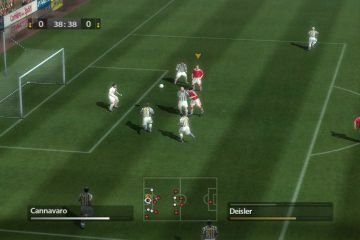 The gameplay is extremely solid, the managerial mode is surprisingly deep and the additional features make FIFA 06 a great sports addition for fans of the sport.